Superstars Namie Amuro and Masaharu Fukuyama join forces to promote Asahi’s new brand Asahi Super Dry Extra Hard in a hot television commercial airing today in Japan. “O-M-G… hey why you lookin at me…?” Namie Amuro embraces her inner shinigami in the new music video for “Fighter” from the film Death Note Light up the NEW world. 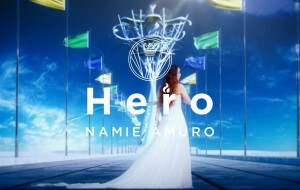 Namie Amuro’s new single “Hero” will be released on July 27th, recorded as the theme song for the 2016 NHK Rio de Janeiro Olympic & Paralympic broadcast. the limited edition version will include 2 music videos, “Hero” and “Show Me what You’ve Got”.